Some flood product companies claim that their products are "FEMA Certified" to meet floodproofing requirements, or "FEMA Tested," but there’s no such thing. FEMA does not certify specific flood mitigation products; so be wary about such claims. However, FEMA does allow non-residential buildings to qualify for the National Flood Insurance Program with a Certification of Floodproofing by a qualified engineer. 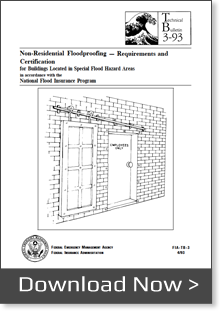 FEMA guidelines for floodproofing non-residential buildings cover the design, construction, and planning of floodproofing requirements under the ‘National Flood Insurance Program (NFIP) regulations, and how to correctly complete the NFIP’s Floodproofing Certificate for Non-Residential Structures. We encourage you to download and read the FEMA documents related to floodproofing. Please see links to PDF files on the right. While National Flood Insurance Program regulations require that non-residential buildings be floodproofed only to the BFE, flood insurance rating procedures include a freeboard, or level of safety criterion. When a floodproofed building is rated for flood insurance, the level of flood protection is assumed at 1 foot below the top elevation of the floodproofing. For rating purposes, the NFIP requires that non-residential buildings be floodproofed to 1 foot above the BFE in order to receive rating credit for the floodproofing design. All of Presray’s flood products are engineered and tested to far exceed FEMA’s technical definition of floodproofing as being “substantially impermeable to the passage of water” as adapted from standard developed by the Army Corps of Engineers page. Parking garages are of particular concern because the flooding of these enclosed areas may result in significant damage to the building and any mechanical, electrical, or other utility equipment located there, such as ventilation equipment, lighting, elevator equipment, and drainage pumps. All below-grade parking garages must be dry-floodproofed; therefore, hydrostatic and hydrodynamic forces must be considered in the design. In most designs, the loadings on the above-grade portion of the building are transferred to the structural elements of the below-grade parking garage. Therefore, any structural failure in the parking garage may well result in a failure of the entire building. A Presray FB77 protects a below-grade parking garage at the Texas Medical Center. 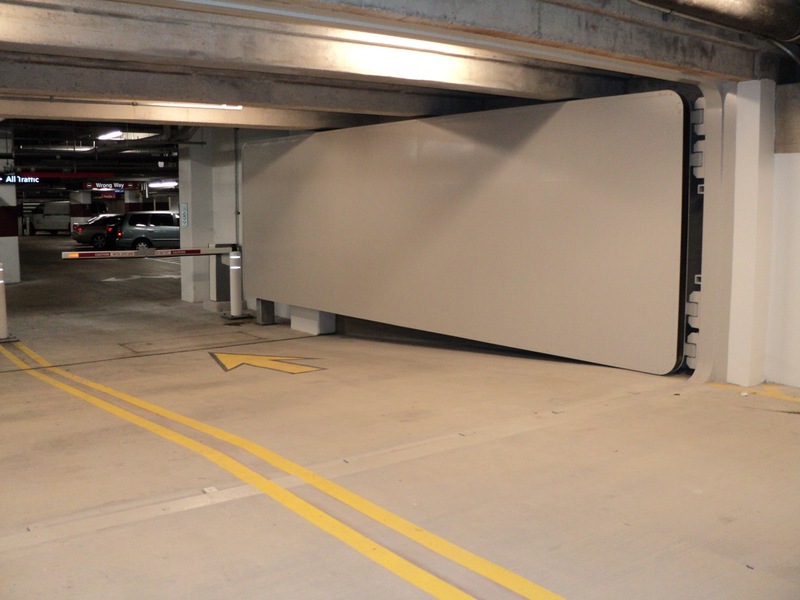 Protecting below-grade parking garages represents significant engineering challenges and is a specialty for Presray. 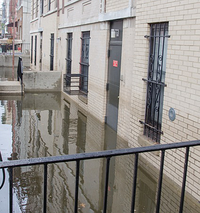 We design our floodgates and flood doors to exceed all FEMA and NFIP standards. These products include the FB44 Hinged Floodgate and the FB77 Hinged Flood Door. For links to a FEMA Floodproofing Certificate, an Elevation Certificate and other valuable resources related to NFIP insurance, go to NFIP Flood Insurance Resources. This FEMA bulletin provides guidelines for buildings located In Special Flood Hazard Areas in accordance with the National Flood Insurance Program. 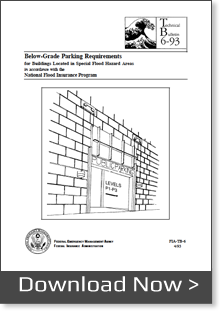 This FEMA bulletin provides special technical guidance for below-grade parking garages for nonresidential buildings in Special Flood Hazard Areas. FEMA Dep. 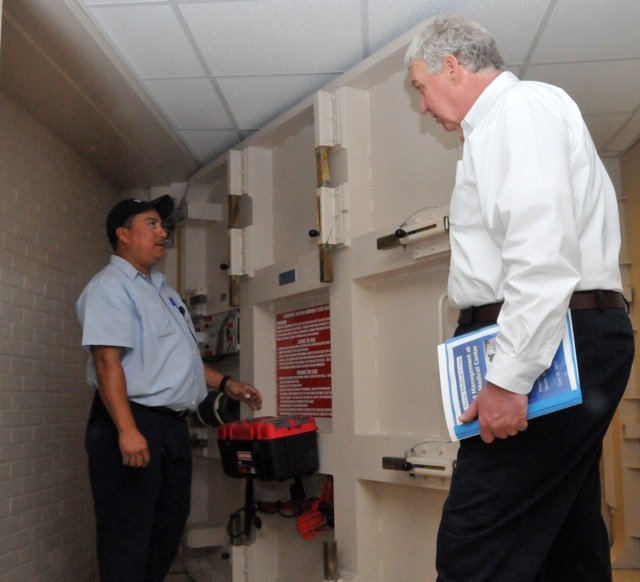 Administrator Rich Serino is shown how a Presray FB77 Flood Door, or "submarine door," prevents flooding of the tunnel complex under the Texas Medical Center.